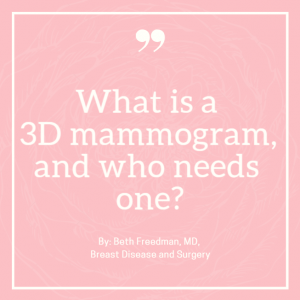 What is a 3D mammogram, and who needs one? A mammogram with tomosynthesis, or a 3D mammogram, is a low dose mammogram which captures many additional pictures of the breast without exposing the patient to any additional radiation. Traditional mammos produces just two images of each breast, a side-to-side view and a top-to-bottom view. 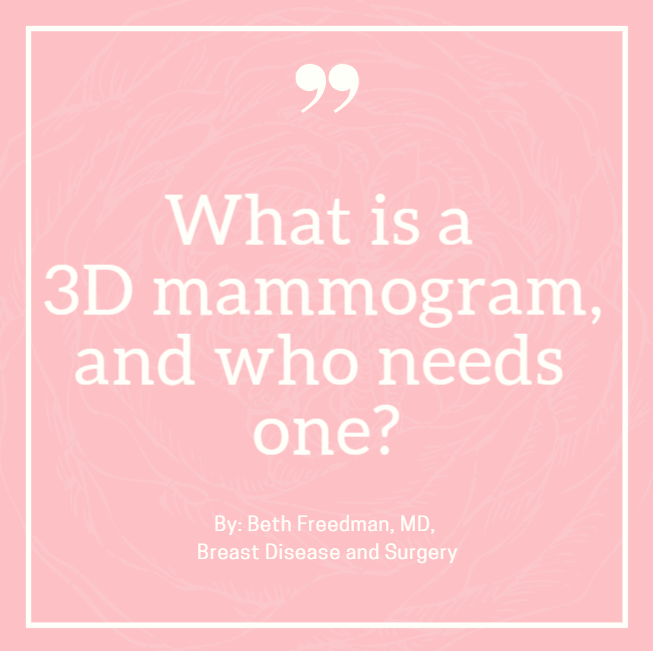 3D mammography produces many X-ray images of the breasts from multiple angles to create a digital 3-dimensional rendering of internal breast tissue. This allows radiologists to view the breast in 1-millimeter ‘slices’ rather than just the full thickness from the top and from the side. This technique cuts down on call backs for additional views, and also provides the radiologist with a crisp clear image of the breast tissue. Patients also report that there is less uncomfortable compression of the breast. Any woman over age 40 can undergo 3D mammography instead of traditional mammography, and it is covered by insurance. Who needs a breast ultrasound? Patients who have dense breasts on mammogram are recommended to undergo a supplemental breast ultrasound as an additional method of evaluating the breast. This provides the radiologist with an additional tool to assess the breast tissue, as dense breast tissue can make it more difficult to detect a malignancy on mammogram. 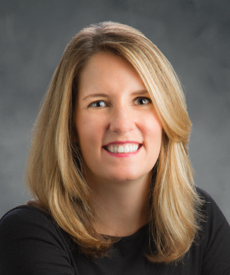 As a breast surgeon, I’m often asked, “why not just have an ultrasound instead of a mammogram?” The primary difference between mammograms and breast ultrasounds is the role they play. Mammograms are a good screening test and can detect cancer at the earliest stages, when we only see calcifications. Ultrasounds, in contrast, look at the different densities in the breast to determine whether there are suspicious masses. However, they are unable to image the entire breast at once. A breast ultrasound is usually done for diagnostic reasons, frequently after a mammogram reveals a suspicious area or density in a breast, or as a supplemental screening tool in women with dense breasts. Who needs a breast MRI? Most women do not need a screening breast MRI. Women who should be considered to have an MRI are those with have a strong family history of breast cancer, including 3 or more female relatives with a breast cancer, a male with a breast cancer in the family, or women who have had a biopsy showing abnormal cells.